Today, our Coop organized several demonstrations for children. Strider, our produce manager, asked us to take advantage of a new shipment of cantaloupes from California and baby spinach from our neighboring town of Farmington. Kathy, our grocery manager, asked us to use a soy milk product on promotion. the spinach into a creamed sauce, and the soy milk into a honeydew smoothie. Kids and grown-ups relished the results. Here are the Horchata de Melon, Pasta With Creamed Spinach, and Honeydew Smoothie recipes. Today, we prepared yogurt, an ancient food product, in three different ways — with a vegetable (spinach), with a fruit (bananas), and finally, with a meat (chicken). We used Nancy’s Organic Yogurt, which is made up only of milk and fermenting bacteria (no sugar, starch, or artificial anything). For the first dish, we blanched spinach and dressed it with yogurt spiced with freshly roasted and ground cumin and coriander. For the next dish, we incorporated ripe red bananas from Chile with blanched almonds and raisins in yogurt sweetened with honey and accented with freshly ground nutmeg. For the penultimate dish, we prepared Andi’s chicken curry with fresh free-range chicken, deboned and wrapped in a golden sauce from a home-made mixture of spices and accompanied by yukon gold potatoes and green top carrots. 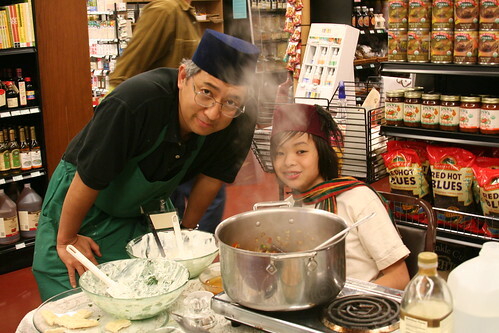 On Saturdays, Andi, my 13 year old son and I conduct food demonstrations in our town’s natural food store, the Just Food Co-op in Northfield, Minnesota. On my first demo day, I prepared a salmon salad with two varieties of Alaskan salmon — Red Sockeye and Pink. For a canned product, the salmon had a fresh and vibrant taste. The Red Sockeye had a more pronounced color and flavor. I served the salmon on slices of organic bread, slices of organic cucumber and individual leaves of organic Belgian endives. To add variety of the demo, I also served fresh California figs accented with carambola cheese and raw honey. The Co-op has ordered cooking equipment. I am excited about preparing cooked food soon.